This procedure measures the potential for water and solid objects to enter and damage or degrade solar photovoltaic (PV) module junction boxes. It is designed for reference by the Lighting Global Quality Standards and will be submitted as an amendment to IEC 62257-9-5 when appropriate. This test would be conducted with a sample size of n=1 for all Lighting Global test methods (ISM, QTM, MCM, and renewal testing). The result of the overall ingress protection (IP) test is a pass/fail assessment on the equivalent of IP3X and a modified IPX4. IP3X is a physical ingress measure that protects against insect intrusion, while the modified IPX4 indicates protection from permanent outdoor exposure to water in the context of rooftop installation. 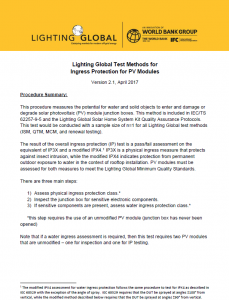 PV modules must be assessed for both measures to meet the Lighting Global Minimum Quality Standards.